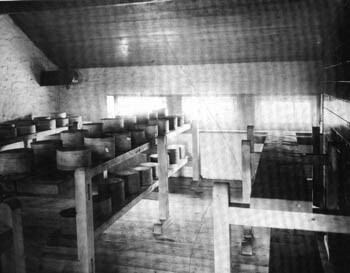 On the hill farms, cheese making and butter making were summer jobs, when the milk flow was at its highest and best quality. Dairy farms made butter all year round. Winter butter is almost white unless colouring is added. Cream was used in cooking, but was often stored or capitalised for sale by being made into butter. John Gate recalls how the separator was used:"Now the cream separator here, you put milk in the top, and that spout, the lower one, was where the blue (skimmed) milk came from, and the top one was for the cream." Skimmed milk could be fed to calves or pigs, but some farms made a thin cheese from it, called "wang" - it was said to be tough enough to use instead of "wangs"... or leather bootlaces. Wang cheese was drained, spooned into muslin, then dipped in brine and hung up to dry. Other full fat cheeses were pressed to form them and help them dry so they would keep well. Right: a curd stirrer, lightly built from birch. The wires cut through the curd that has formed in the cheese vat. Later the stirrer is used while the curd is being drained, which breaks the mass and enables the whey to drain off thoroughly. The curd is packed into cheesecloth in a mould and pressed; properly and cleanly handled, cheese will compress uniformly and keep well for sale or for winter use. 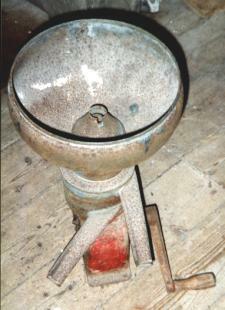 Left: A household cheese press, designed to press out the remaining moisture from the curd. The long handles give plenty of purchase when tightening the screw-down pressure plate. After several days with gradually increasing pressure, the cheese is wrapped in fresh cheesecloth and allowed to ripen in a cool airy room. 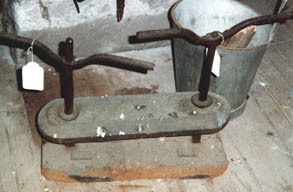 This style of press needed daily attention to maintain pressure; but the traditional stone "cheese weight" could be left unattended, because gravity did the work. This is a larger cheese press which could handle two big cheeses at once. It stands over five feet tall. 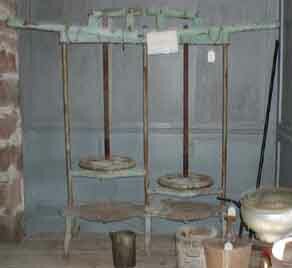 In the foreground are milk pails and a cream separator. .....in 2001, under the central window, the web minion worked at a computer, designing the first version of this web site.